With your help, Mobility 21 sent a strong message to legislators urging their immediate action to approve legislation needed to prevent delays on the Riverside County Transportation Commission’s (RCTC) Riverside Freeway (SR-91) Corridor Improvement Project. To date, more than 65 letters from Mobility 21 supporters have been sent to the legislature. AB 2098 (Miller) has passed both the California State Senate and Assembly and is now headed to the Governor’s desk for his signature. Legislation is required to fast-track the $1.3 billion project using the design-build project delivery method. This will create jobs and relieve congestion three to five years sooner than under traditional procurement methods. Our advocacy work is making a difference for rail safety programs, too. More than 70 letters of support from Mobility 21 members were sent to the California legislature encouraging them to support legislation to authorize the California Transportation Commission (CTC) to allow Southern California to move forward with vital rail safety projects, including Positive Train Control. Because California currently does not have a state budget, the CTC cannot allocate funds for rail safety projects without this important legislation. Our work is not done. Make your voice heard and send a letter of support today to help Mobility 21 fight for rail safety funding for Southern California, including Positive Train Control technology that could have prevented the tragic Metrolink accident in Chatsworth. Join the chief executives of Southern California’s transportation commissions during the Mobility 21 Summit closing general session. Get a behind-the-scenes look at upcoming capital projects in Los Angeles, Orange, Riverside, San Bernardino, San Diego and Ventura Counties as panelists discuss the future of transportation and the reality of our funding crisis. Summit registration now open! Read the complete Summit program andregister online. Sponsorship opportunities available. Read more about the available sponsorship packages. If interested, contact Marnie O’Brien Primmer at 949.288.6884 or mprimmer@mobility21.com. Together with Orange County Transportation Authority (OCTA) officials, Mobility 21 Board Member and OCTA CEO Will Kempton and Mobility 21 Board Member and Orange County Business Council President and CEO Lucy Dunn joined Mobility 21 Executive Director Marnie O’Brien Primmer to celebrate the start of construction on the first segment of the Orange Freeway (SR-57) project this month. With construction on the first segment of the project expected to be complete in summer 2014, improvements include the addition of a northbound lane from north of of the Riverside Freeway (SR-91) near Orangethorpe Avenue in Placentia to Lambert Road in Brea. Not only will this project create more than 5,000 jobs and reduce traffic and delays for thousands of commuters every day, but improved mobility on this stretch of freeway will ease the flow of commerce on a vital goods movement corridor. Gov. 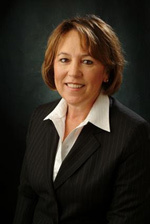 Arnold Schwarzenegger recently announced Fran Inman’s appointment to the California Transportation Commission (CTC). In her new role, Inman will join Mobility 21 Board Member and fellow CTC Commissioner Lucy Dunn in programming and allocating funds for California’s highway and transit projects. Don’t miss the special reception on Friday, Sept. 17 honoring Caltrans Director Cindy McKim and Commissioner Inman, hosted by Mobility 21, WTS Orange County and the Orange County Business Council’s OCMoves. The Long Beach Board of Harbor Commissioners approved the Environmental Impact Report for the nearly $1 billion project to replace the deteriorating Gerald Desmond Bridge – a vital cargo route carrying 15% of the nation’s goods. The bridge will include three traffic lanes plus emergency lanes in each direction and stand higher than the existing Gerald Desmond Bridge to accommodate the new generation of taller green cargo ships. The project is estimated to take five to six years to complete and will create approximately 4,000 jobs per year. Starting in fall 2010, The Source online transportation news and feature service will join mobility21.com as another excellent source of transportation news for our region. The Source debuted on metro.net – L.A. Metro’s website – in October, 2009 following the Mobility 21 Summit. It was created in response to the dramatic shift in how the public gets information and as a way to convey in a simple and correct manner, complex issues that face 21st century transit agencies …. particularly in Southern California. Since its debut, The Source has logged more than 1,000 posts. With contributors like Pulitzer Prize-winning journalist Steve Hymon and car-less in L.A. blogger Frederick Dennstedt a.k.a. Fred Camino, The Source is updated throughout the day with key developments and unique viewpoints that help the public keep tabs on what’s being done to keep our region and how taxpayers’ transit sales tax dollars are being spent. The Source showcases a steady stream of real time news about critical transportation issues as well as feature stories packaged with video, photos and other compelling visuals. FAST, Fixing Angelenos Stuck in Traffic, is a nonprofit organization committed to improving congestion by supporting short-term strategies to relive the thousands of commuters trapped in Los Angeles gridlock everyday. By supporting and optimizing existing transit options, FAST seeks to ease the negative impact to Los Angeles’ economy due to congestion and get people home and to work faster. FAST’s coalition advocates optimizing our current system, while working together with long-term solutions such as the 30/10 program and high-speed rail. To learn more about short-term strategies for improved mobility, visit the FAST website. CSULB Center for International Trade & Transportation: Panama Canal Expansion: The Battle for Jobs and Cargo. Who Wins? Who Loses? Who Decides?